Colo. 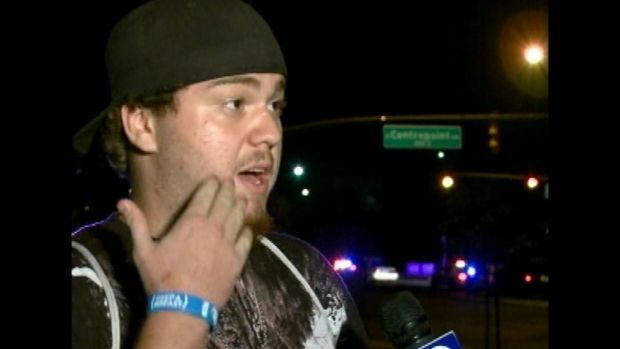 Shooting Survivor: "He Pointed the Gun at Me"
Witnesses to the deadly shooting at the midnight opening of "The Dark Knight Rises" in Aurora, Colo., at first mistook the gunman for a planned part of the show — and then "mass chaos" broke out. Moviegoers said the gunman entered Theater 9 of the Century 16 multiplex from an emergency exit door while dressed all in black. They described him as wearing a bulletproof vest and a gas mask. He was armed with two gas canisters and three guns, they said. "Everybody thought it was a joke or something," moviegoer Skye Kim told Denver's NBC affiliate 9 News. They only realized otherwise, eyewitnesses said, after the two tear gas canisters the gunman threw into the audience exploded. Even then, Roland Jones told the Denver Post he believed the billowing gas was a special effect. "He looked so calm when he did it," witness Trey Freeman told 9 News, referring to the moment when the gunman threw two tear gas canisters just before he began his shooting rampage. "It was scary. He waited for both [canisters] to explode before he did anything," he said — and then, he added, the gunman began shooting at random into the audience. Jennifer Seeger, who was sitting in the front row of Theater 9, said the gunman pointed a gun at her head but then shot people sitting behind her. "The bullets were falling on my head," she told the "Today" show, saying the casings burned her forehead as they fell. "Everyone's going for the door and then everyone starts saying, 'No, he's going to shoot people going for the door,' and he did," she said. "They're trying to escape, and he shot those people as well." As she crawled for an exit, she saw a teenaged girl lying dead on the stairs. The gunman, meanwhile, said nothing, she and Freeman said. "People started ducking, running out. It became chaos after that," Sierra Graves, who was at the movie with Kim, told 9 News. "We ducked and waited, and then we ran out." Corbin Dates, another eyewitness, told the "Today" show the shooting seemed to last up to 15 or 20 minutes. "It was all families, little kids… You know, it was a 'Batman' premiere," Kim added, struggling to understand why the shooting had occurred. A 3-month-old and a 6-year-old were among those injured in the shooting, Denver area hospitals confirmed. Salina Jordan told the Denver Post that shots were fired into Theater 8, too. She said one girl was struck in the cheek and another, who looked about nine years old, in the stomach. Ben Fernandez, who had planned to see the 12:05 screening but instead wound up at a 12:10 screening, described an overwhelming scene as he left the theater amid the shooting. "We were just trying to get a grasp on what was happening. It was just total chaos. There were people running, screaming 'my friend just got shot, my sister just got shot' everywhere you turned. People were just in a complete panic," he told 9 News. After he was ushered out of an emergency exit, he said, he saw a girl who appeared to have been shot twice in the leg and whose stomach was bloodied. "I definitely want to know if that girl is alright," he said, saying he was still haunted by the expressions on victims' faces. "They just had a look in their eyes, and it was just a scary look. You don't see people like that on a normal basis," he said. "It's a look of fear, or… I don't even know, maybe close to death." 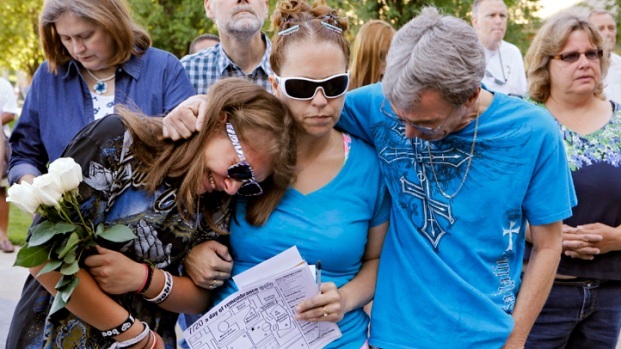 The suspected gunman, identified as 24-year-old James Holmes, is now in police custody, NBC News reported.